Just a quick update on the Vote for Islay at FilmG 2019 entry from December: One of the three entries from Islay has been shortlisted for an award. The entry from Islay High School in the Youth category, ‘Am Bruadar’, has been picked in the FilmG Award For Gaelic – Learners category. Congratulations, and fingers crossed you will be announced as winners at the awards ceremony in Glasgow in February. Voting is simple: Go to the page for the entry you want to vote for and click on the yellow ‘Vote’ button. Done. Happy voting! I hope you enjoyed the video, I thought it was very nicely done. 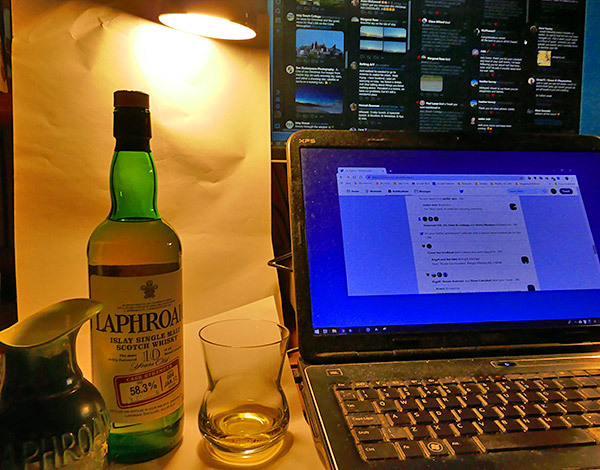 The whisky is the Laphroaig 10yo cask strength batch 04, which I had opened for my 10 years Twitter milestone (with New Year’s Day in mind). A rather lovely dram, going down very nicely while the Radetzky-Marsch is playing as I type this. 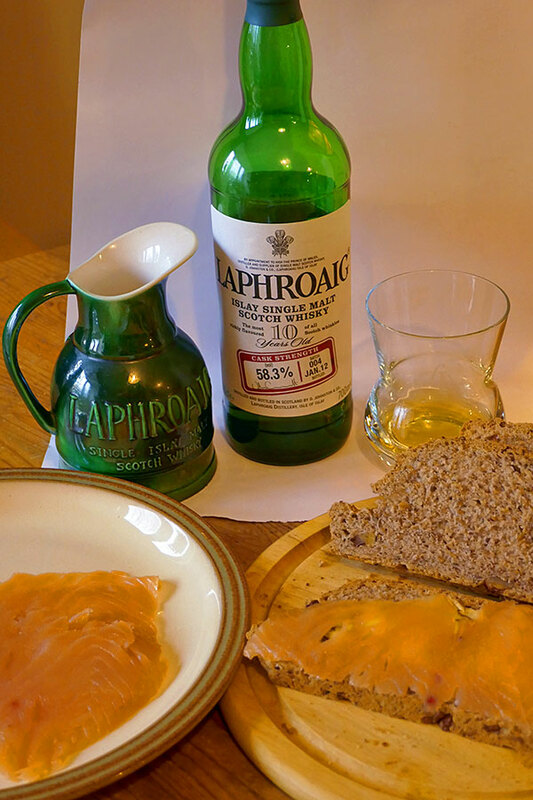 It was aged for 9 years and finished in a Rivesaltes wine cask from the far south of France. 2 years younger than the Gorag 02. Very nice with some 85% dark chocolate after the venison burger I had this evening. It’s that time of year again, same as last year it’s time to vote for Islay’s entries at the FilmG competition. For this year I’m aware of three entries from Islay so far, from the High School, from Bowmore Primary and from the Islay Voices. Same as last year everyone can vote in the ‘People’s Choice Prize’, to do that all you need to do is to go to the page for the entry you want to vote for (linked below the videos) and click on the ‘Vote’ button. Simple as that. 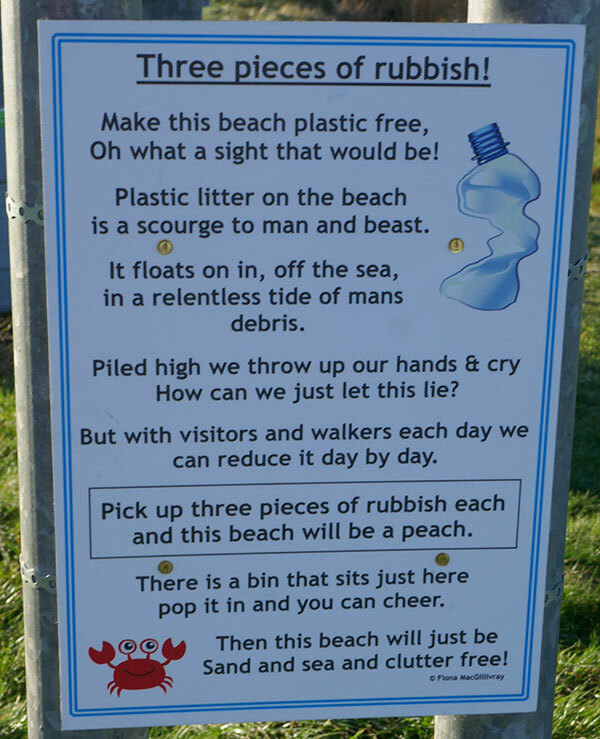 You can vote for it at the GUTHAN ÌLEACH – Muinntir Ìle page. The voting is open until the end of January, the winners (including hopefully one from Islay) will be announced at the annual awards ceremony at The Old Fruitmarket in Glasgow on 08/Feb/2019. If you’re on Facebook also follow the CnaG Ìle group for more. 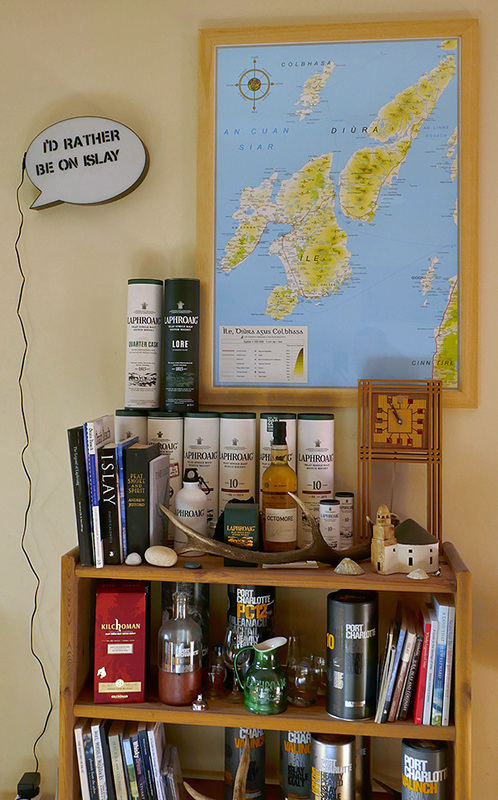 From my recent Islay visit I returned with a quite large souvenir which is now hanging on one of my walls. 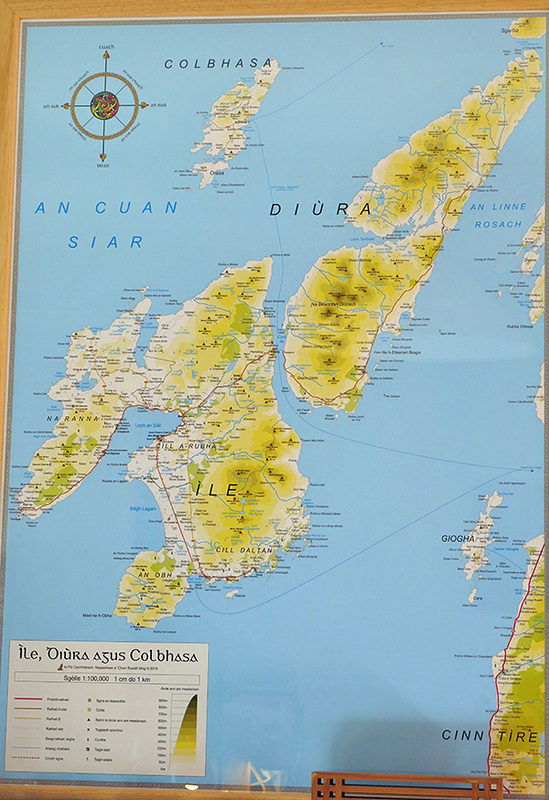 A few weeks ago Pat Farrington announced on Facebook that she had some maps of Islay, Jura and Colonsay in Gaelic for sale. 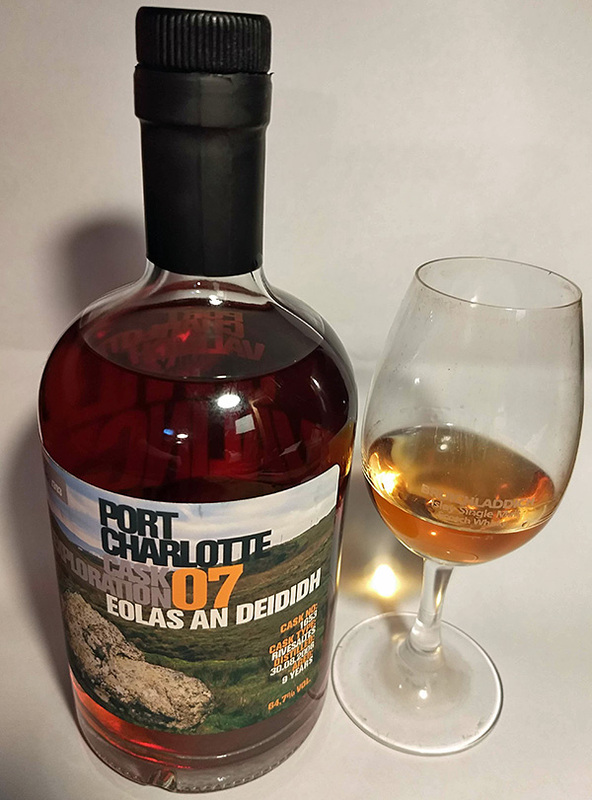 I contacted her that I was interested and if I could pick one up during my Islay visit in November (they were sold pick up / delivery on Islay only). We agreed to meet in Bowmore, where £10 and in return the map changed hands. From Bowmore I drove over to Islay House Square, where I dropped it off at Islay Studios to be framed. Mark had mentioned that they had framed another copy, I decided to do the same to keep it in prime condition and make it easier to hang up. I picked a light coloured wood as most of my furniture is pine and I wanted them to go together. I’m very happy how it turned out, I think it fits very well above the shelf. The map looks very nice in the frame, it covers many places including villages, hills, mountains, lochs and more. 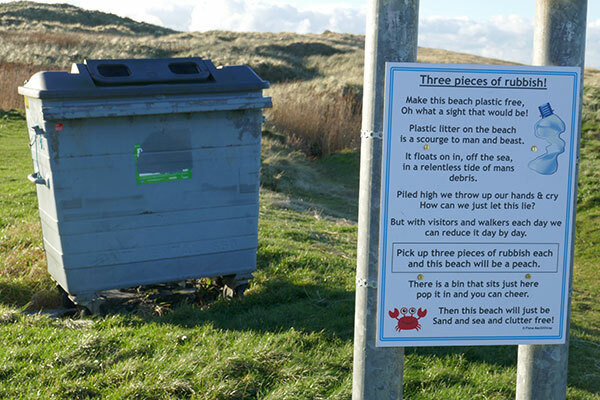 Of course all in Gaelic, as that’s the whole point of the map. The speech bubble is a lamp (hence the cable), but it didn’t look very nice switched on for a picture, so I turned it off (it looks very nice otherwise and is lit while I’m typing this). 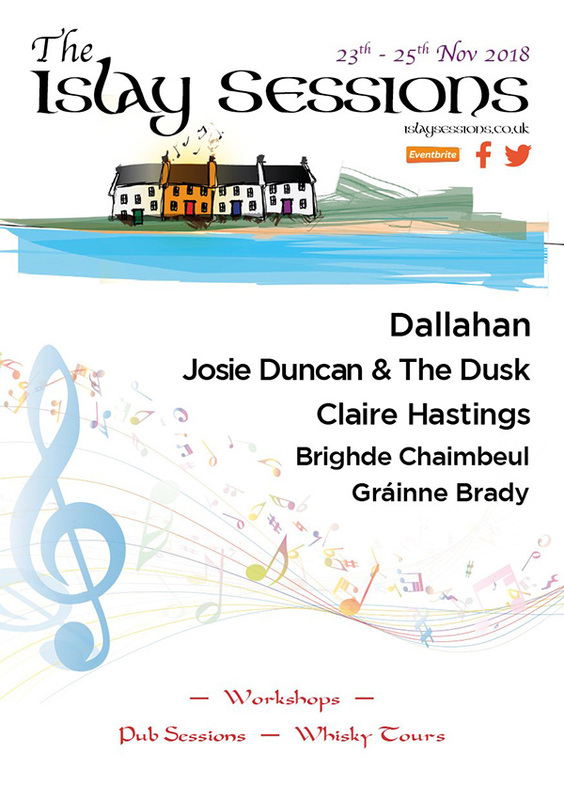 Still two weeks to go until the Islay Sessions 2018 music festival, but as I will be leaving a bit earlier for Islay than in previous years I decided to get this post in now. If you’re on Islay 23-25/Nov/2018, as of writing this there were still some tickets available, although not for all events. Looking forward to seeing Gráinne Brady again (having seen her at several Islay Sessions over the years), this time launching her solo album (I believe that session is sold out now). That’s all I’ve got for now. Hope to see you at the Islay Sessions or if not elsewhere on Islay in the two weeks leading up to them.